St Mary’s church dates from about 1150, and is the largest and most historic church in Langley. It benefited greatly from the expansion work of the Kedermister family in the 17th Century, which gave the church a tower and bells and also a unique library, which has not been changed since. 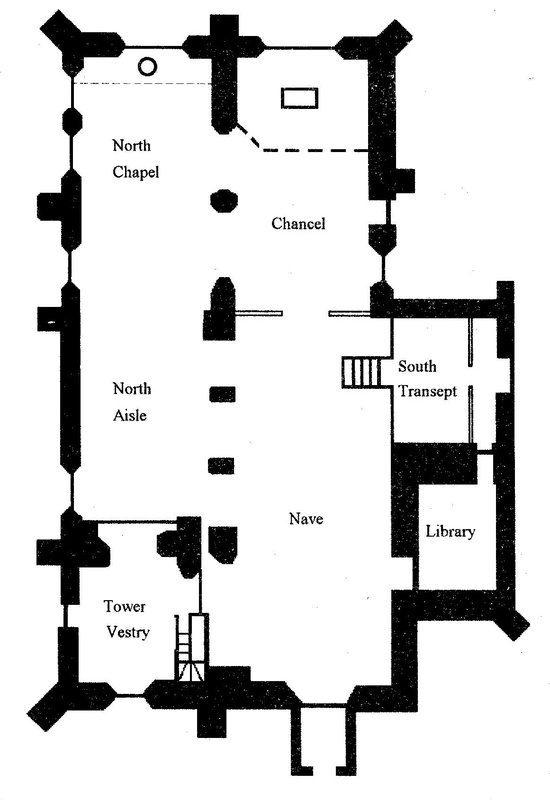 On the Left is a front view of the church and this corresponds to the layout shown below with the West Porch being the entrance shown at the bottom of the plan with the tower to its left. The name “Langley Marish” comes from the name of Christine de Marisco who held the manor of Langley on behalf of the Crown between 1282 and 1311. Three generations of the Kedermister family, whose fortunes arose from the careful running of the royal lands now known as Langley Park. John and his son Edmund Kedermister were responsible for rescuing the park from neglect during the second half of the 16th century, and were so successful that Edmund’s son, Sir John Kedermister, was given a lease on the park by Charles 1 in 1626. 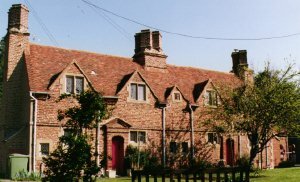 John enlarged, restored and refurbished the church, building the library and the almshouses which bear his name (1617) before his death in 1631. Click on plan for a larger view. 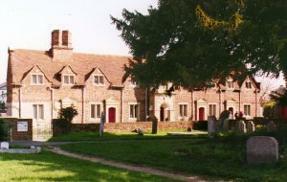 John Kedermister died without a son, so his daughter Elizabeth and her husband Sir John Parsons inherited the estate. Then the Seymour family bought the estate when he died. Sir Edward Seymour was an important Parliamentary figure during the second half of the 17th century. He eventually became Speaker of the House of Commons and built the second block of almshouses. From the Seymour family, the estate came to the Masham family, and eventually to the Duke of Marlborough, who needed a house that was closer to London than Blenheim Palace. In 1799 the estate was sold to an up and coming young man, Robert Bateson, who took the name Harvey when he inherited a large sum of money from his uncle. He became High Sheriff of Buckingham, and in 1791 was made a Baronet. He died without legal offspring, so the title was not passed on. The Harvey family lived in Langley until 1931, when the estate was sold to Buckinghamshire County Council, and the Langley Park was created. 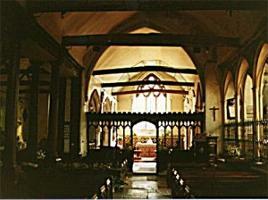 In the foreground you can see the chancel screen. This is built of oak in the perpendicular style, containing some 15th century woodwork. It may have been reconstructed during the 19th century, when the crenulations of the cornice were added, possibly at the time when the original royal coat of arms, creed, ten commandments and the Lord’s prayer texts were removed. 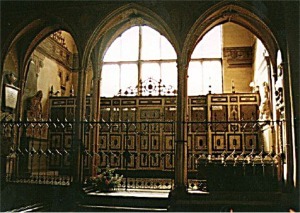 The chancel was enlarged and decorated during the 15th century. Many of the windows and doors have figures or “lapel stops” most of which date from the 15th century. The bishop with mitre was added in the late 19th century. Look also at the floor, which has some original 14th century decorated floor tiles. Probably made at Penn in Buckinghamshire in red clay, they were decorated with figures – a mermaid, a lion and a four leaved vine pattern can still be made out. The sanctuary area was enlarged in 1992. At its centre is the communion table, which is believed to have been the one bought in 1634 by the Churchwardens at a cost of 16 shillings (80 pence in modern money – don’t times change!) On the right hand side are a series of 15th century recesses known as Sedilia (where the priest, deacon and sub-deacon sat at mass), and the Piscina, the far niche which originally had a basin for washing the vessels after mass. Above the communion table is an elaborate brass chandelier dated 1709 with the names of the churchwardens of the day, John Tice and James Reddington. The east window which faces you dates from about 1330 and is now filled with plain glass, with some fragments of the original ancient glass retained in the top lights. This window was restored during 1998 with much of the original and much decayed “nice” stone having to be cut out and replaced. Take a 3D look around the east end of the church. On the left of the sanctuary, there is an elaborate memorial to the Kedermister family, showing on the left John and Elizabeth Kedermister at prayer, with their five children below them. On the right are Anne and Edmund Kedermister with their 13 children. As four of these are shown in their cradles, it seems likely that these died in their early years. John Kedermister, founder of the Library, is the oldest of these children. The nave (the bit where everybody sits) was first built in about 1150, but was enlarged and much changed in the 14th century. The roof was reconstructed in 1983 following the line of the 14th century barrel vault. This photograph is rather dark, but on the left you can just about see the colonnade, a wooden roof support which allows access into the north aisle. This replaced the original stone arches just before the Civil War. On the left of the nave, in one of the tower arches, you will see the Royal Arms given to the church in 1625 by St John Kedermister, the year that James 1 died and Charles 1 succeeded him. They were carved in oak with superb detail and then painted. 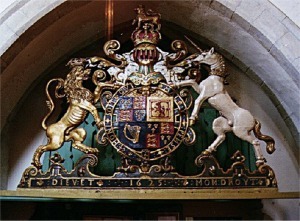 In the centre of the arms is the royal shield, showing the three lions of England quartered with the three fleur-de-lys of France, a lion rampant representing Scotland, and a harp to represent Ireland. Below the lion’s right foot are the arms of the Kedermister and Garrard families, and below the unicorn’s left foot are the arms of the Kedermister and Wentham families. The fretwork panels in the Chinese Chippendale style were probably installed when the Duke of Marlborough acquired Langley Park. There are many memorials in the chapel to the Harvey family. Standing at the right of the chapel is the one removable piece of furniture, an ancient Parish Chest. This is made of oak, and probably dates to the 12th century. It has three hasps, and was originally used to store church valuables and the keys to the Kedermister Library. Three separate keys had to be obtained before it could be opened. The Kedermister chapel is still owned by the Lord of the Manor, now in the hands of the County Council, who help to pay for its upkeep and that of the Library. Click here to find out about visiting the Kedermister Library. Click here for 3D views of the Library and the Kedermister Pew. The Library was founded before 1631, when Sir John Kedermister’s will allocated a number of additional books to the collection, which was for the benefit of “Ministers of the said town of Langley and such other of the County of Buckingham as resort thereto”. The original vellum catalogue dated 1638 still hangs there. 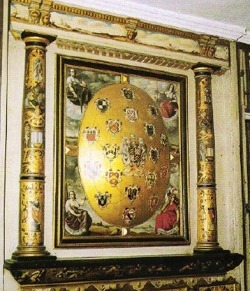 The heraldic overmantle to the fireplace, shown above, provides a focus for the sumptuous painting of the room. The room is lined with bookshelves, with the doors to each cupboard decorated inside and out, the panels having pictures of the benefactors, and of Saints and Prophets, perhaps to indicate the contents of the shelves as these would be most unlikely portraits otherwise given the religious climate of the times. 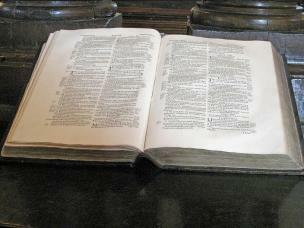 Most of the volumes in the library are theological works in Latin, printed in the late 16th or early 17th century. The greatest treasure of the collection, an 11th century illuminated manuscript Gospel of the Winchester school, is deposited on loan in the British Library. Most of the books appear to have been specially bound, and most are in good condition. This Bible was presented to Sir Edward Seymour after his term in office as Speaker of the House of Commons from 1673 to 1679. He donated it to the Kedermister Library in memory of his father, Sir Joseph Seymour, who died in 1697. Sir Edward himself died in 1707. The text is the ‘Authorised’ or ‘King James’ translation, first published 400 years ago, in 1611. The spelling is in the original style rather than the more familiar ‘modernised’ version of 1769. 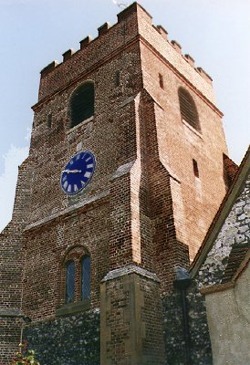 The tower was rebuilt in 1609 on the base of the previous flint tower. The date is cast in lead on a rainwater hopper on the east of the tower. At the base of the tower is a recently restored vestry, surmounted by a ringing chamber, a clock chamber and the belfry containing a ring of 8. The tower was restored and repointed in 1996 and the original ring of 6 rehoused in a new frame with two additional bells. The original ring of six bells was housed in a 17th century frame: three were cast in 1649 by William Whitmoore of London; the tenor bell by Richard Phelps of Whitechapel in 1706, the treble and second by Stainbank of Whitechapel in 1937. Casting of bells in 1649, the same year in which Charles I was executed, may seem unusual but actually bell ringing received a boost during the Commonwealth. More puritan times meant that bells were no longer welcome as part of the church service but their secular use increased and William Whitmore, the founder who cast the bells here in 1649, also cast bells for Windsor Castle the following year. Undoubtedly, Langley bells would have rung out for the restoration of Charles II in 1660 and three of those same bells continue to ring out today. The ringing room is very high, and in the ceiling is an unusual square plasterwork design probably from the 17th century. The clock was made in 1818 by William Hardwick of Windsor; it and the dial were also restored in 1996, and a plaque containing the Kedermister arms hung over it where there was originally a carved version of the same. The north chapel and north aisle join one another. Built in the 14th century, they were enlarged during the 17th century, when the windows were also reset. The North Chapel now contains the Font, positioned there in 1991, an octagonal design probably made just before the Reformation. Over this is the East Window, depicting the Crucifixion and the Blessed Virgin Mary and St John. It was designed in 1909 by Messrs Percy Bacon and brothers, and is in the style of the 15th century. At the rear of the North aisle is the minstrel’s gallery, where the musicians accompanying the service would have played until an organ was purchased for use in 1865 and sited there.